When it comes to wedding invitations and wedding stationery the key is to be right on mark with what your big day will look and feel like. 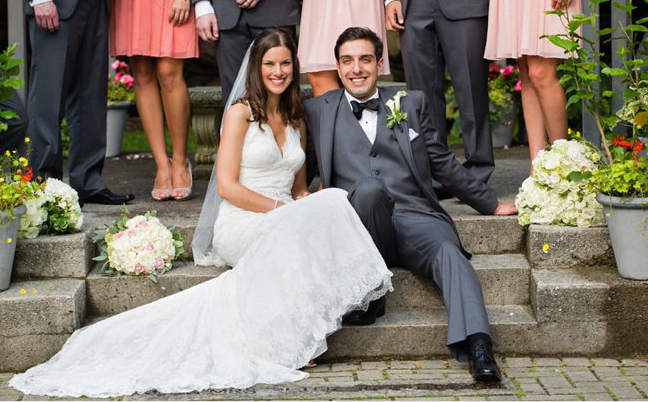 Jennifer had a great vision meaning that her final invitation package flowed oh so well with her wedding day. Being from the US Jennifer had lots of information she needed to include with her invitation package since many of her invitees were not from the Toronto area. So that said a pocket enclosure was a must! Aside from the invitation and reply cards we also included a detailed map card with accommodations on the backside and a reception card. Myra's sense of style and visual thoughts were very unique making her stationery that much more and interesting for me to design. She started off by sending me visual ideas such as old fashion european posters and menus. Being foodies Myra and Bruno wanted their joy of food to be a big part of their wedding day. 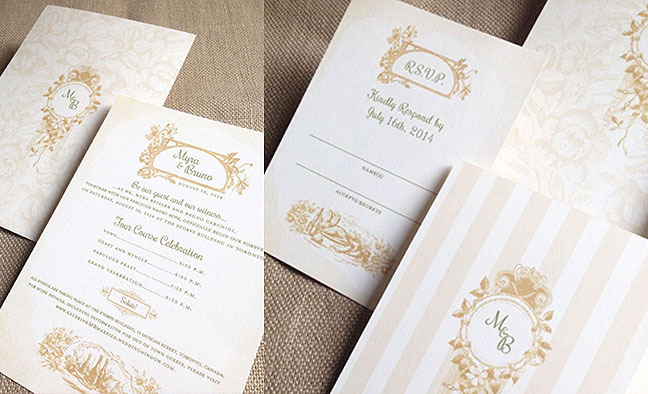 Starting with their wedding invitations custom designed to resemble vintage style menus. We also did recipe cards and each guest table was named after 9 of their favourite restaurants. From Portugal, Bahamas, Palm Springs to Toronto each table was listed with a description/story inside their ceremony programs for all of their guests to read and keep. Myra was very open to mixing a few patterns together keeping her over all design tasteful, classic yet casual. And lastly we carefully matched up her invitation package and wedding day stationery to her distinct colour palette made up of olive green, champagnes and caramel creating an overall a natural, vintage, euro look. 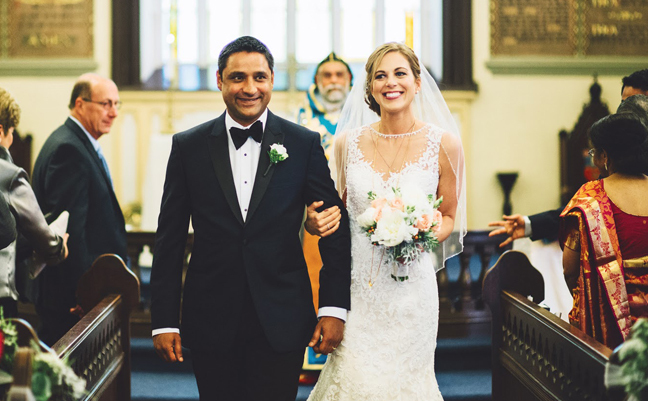 Planned with a timeless and classic touch Meaghan and Ben also added a strong Breakfast at Tiffany's twist to their wedding day. 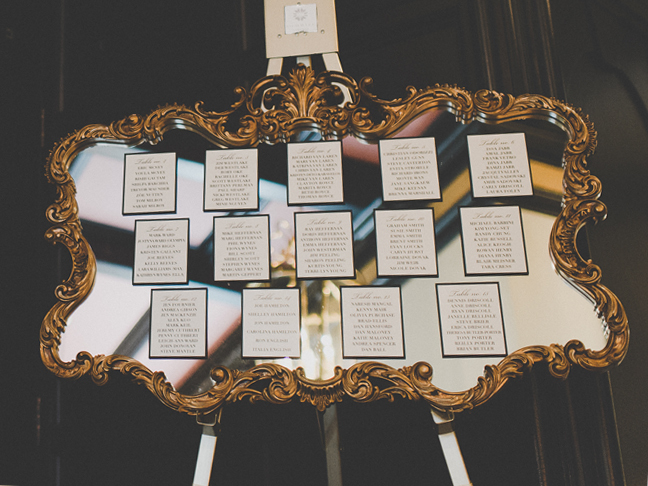 Their invitations were printed on a full champagne shimmer paper ensemble and printed in all black. The entire design was typography based - in other words we had fun with type. 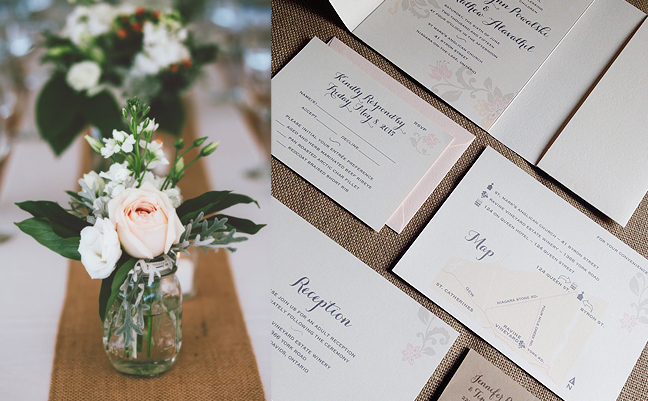 I kept Meaghan and Ben's monogram simple and added a soft champagne watermark pattern throughout the entire stationery package giving it a romantic look and feel. 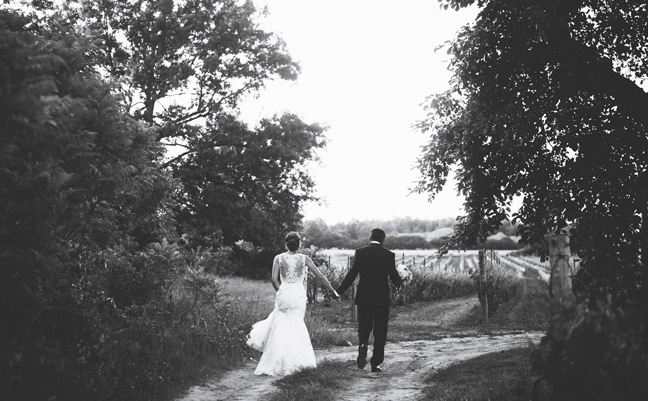 Below you can see more of Meaghan and Ben's wedding day taking place the the "Old Mill" in Toronto courtesy of Jennifer Moher Photography. 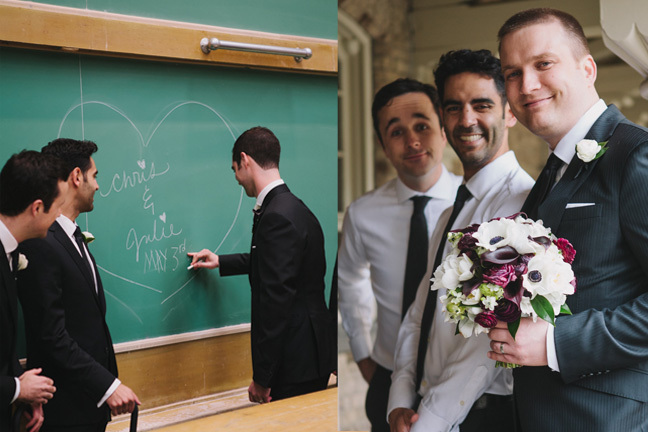 A downtown Toronto couple brings family traditions to their wedding with a few illustrated details. 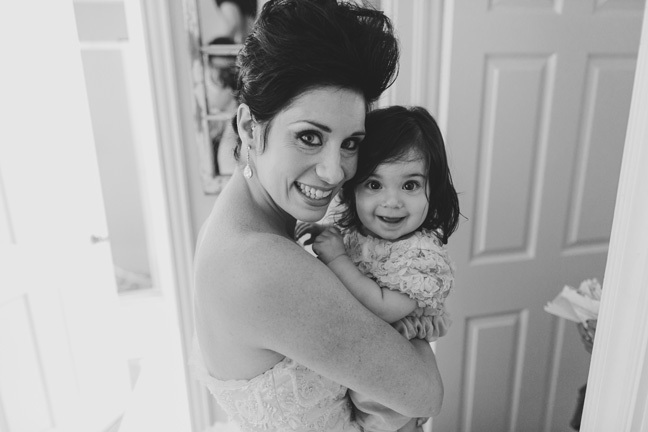 Catherine and Matthew had a beautiful late summer wedding with family, friends and their special baby girl Odile. Catherine came to me with the idea of using Matthew's brother's hand drawn tattoo illustrations throughout their wedding stationery. We worked together closely in designing a classic yet vintage look using plum, golds, creams and black. 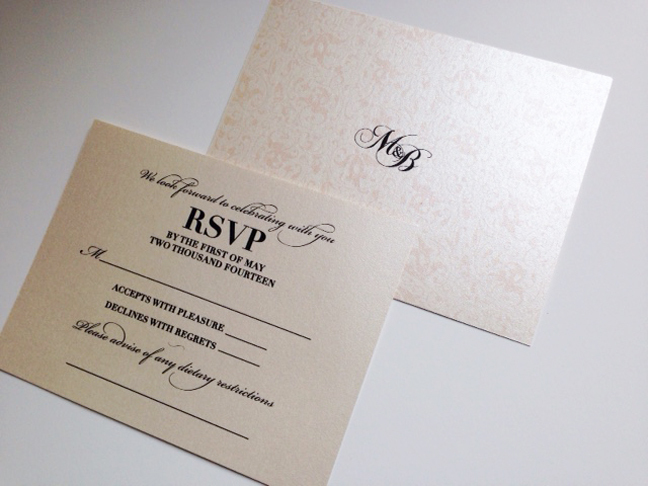 From the save the dates to wedding invitations and day of stationery everything had a nice consistent flow. Traditional with an edgy twist this is a great example of how you can bring your own ideas or artwork to the design of your wedding invitations and stationery. Photography by Mimmo & Co. 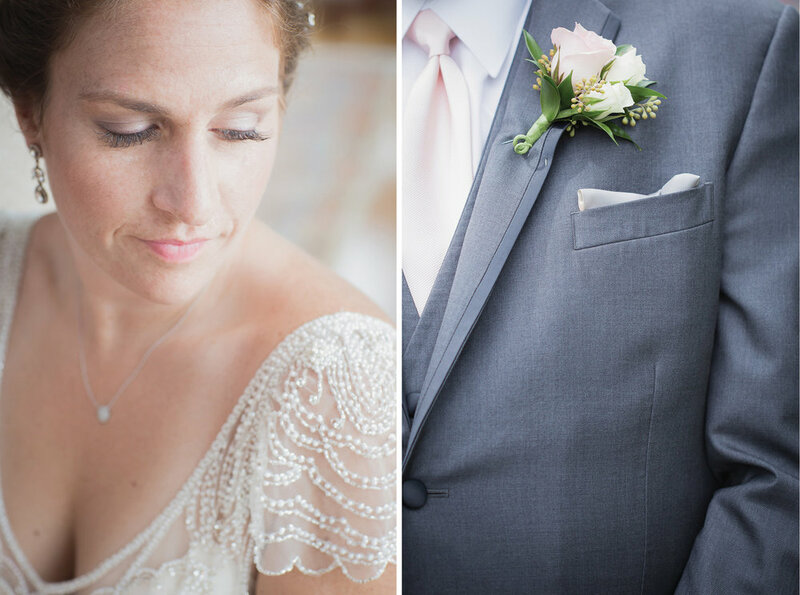 I'm happy to post Elana and Peter's romantic Santorini wedding. What a spot to have a wedding... I visited Santorini myself a few years ago and it is absolutely a stunning place to be. Elena and Peter were after a simple euro design with a casual feel and a soft colour palette of champagnes and blush pinks. Their invitations were printed in 3 different languages. English, Greek and Russian. Along with the invitations and replies we included a map card of Santorini as well as an itinerary card. The full package was enclosed in a beautiful champagne pocket enclosure sealed with a shear blush pink ribbon. Beautiful, simple and informative. I think 3 words that would best describe Arden and Tyler's wedding would be chic, urban and fun! 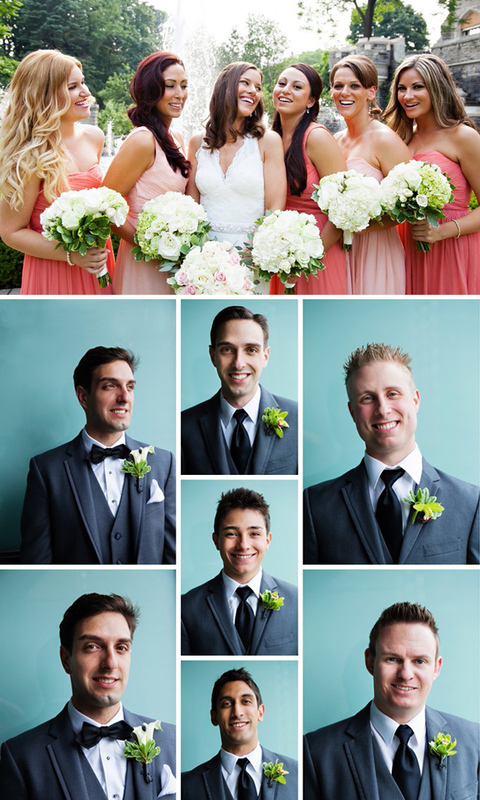 Both their ceremony and reception took place at the Shangri-la Hotel in downtown Toronto. 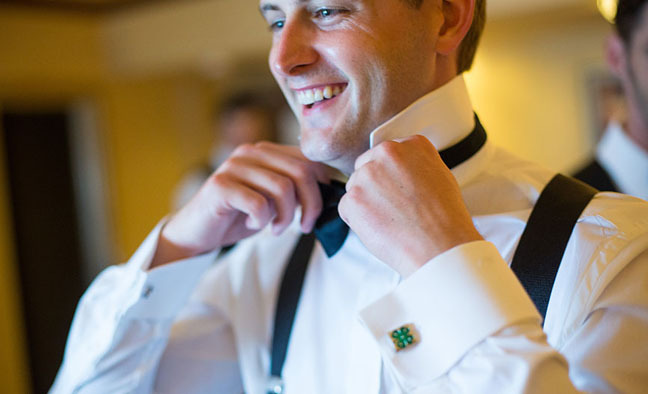 Along with beautiful florals and decor Arden and Tyler also did an amazing job of tying in their wedding monogram into their big day in more tasteful ways then one. Each invitation set included a map of downtown Toronto as well as guest accommodations. There even was a next morning brunch invite which was designed to match and sized to go inside the lovely mini envelope glued within their silver pocket enclosure. 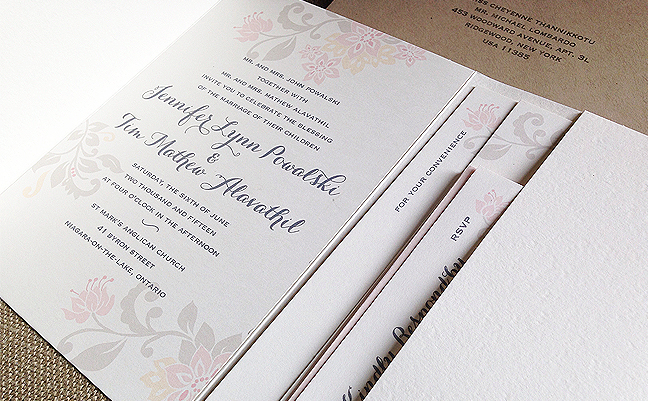 Overall their wedding invitation package was sleek, shiny and classy. 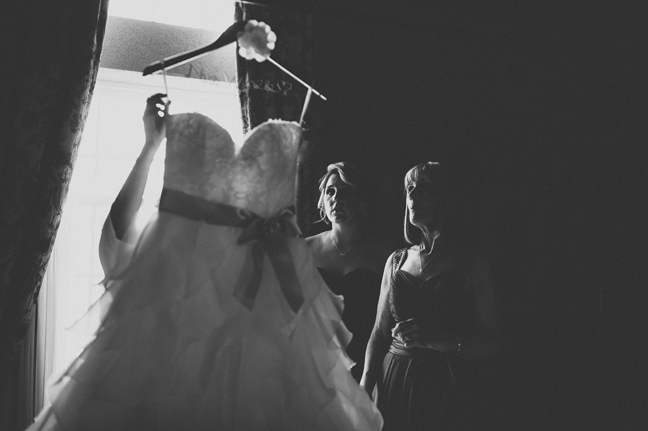 Arden and Tyler's wedding was photographed by Artage Pictures.